The wait for the Real Techniques face brushes review is over! 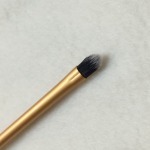 If this is the first review you are reading about the brush line, I invite you to read the eye brushes review post. There you will find a quick overview of the brand, quality and creation of the brush line and some other interesting info. Lets begin with the Detailer Brush. Is the smallest of the Core Collection set. As its name says, it’s great for small areas when you are looking for detailed and precise results. Its shape is perfect for highlighting the inner corner of the eye and applying pigments on the center of the eye. 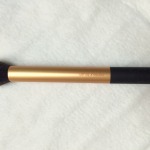 I also use this little brush for concealing small areas and works perfectly fine with lip products. 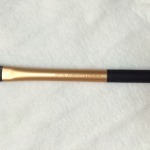 The Pointed Foundation Brush. I find it a bit small for my face and it takes too much time to apply my foundation with it. On the other hand, it blends the under eye concealer perfectly fine. Being a pointed brush it can reach the inner parts of the eyes and nose. Because of its dome shape the Contour Brush not only gives you precision on the areas you’re working but it also blends the products as well. So with just one brush you can do all the contouring your face needs. 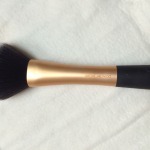 This brush works great with powders, liquid and cream products (highlighters and bronzers). Try using it to set you under eye concealer. 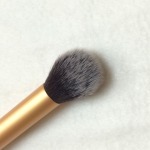 Here comes the star of this set, the Buffing Brush! 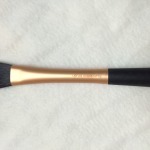 If you are a looking for a flawless finish this is the brush you need! It has the perfect size, it does the job in no time and it feels really soft on the skin. I have used it with cream and liquid foundations and the results are just amazing. 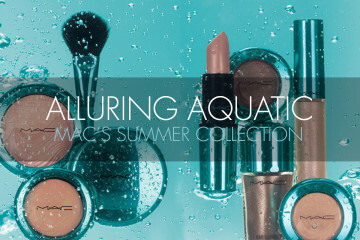 Also works great with cream blushes and bronzers. 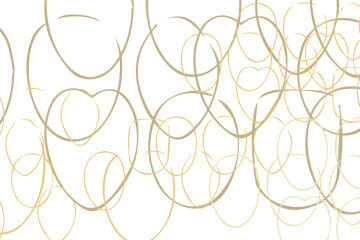 I love love love this brush! The Foundation Brush is a flat angled brush that is both soft and firm. Although it’s intended to be used with foundations, I prefer using it for applying primers, contouring and concealing the under eye area. It works great with cream and liquid products. 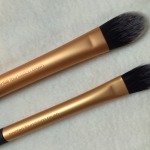 The Essential Foundation Brush is thicker and a bit wider than the pointed foundation brush but both have the same shape. So, I use this one in particular when I have less time to apply my makeup. It does the job faster covering larger areas. 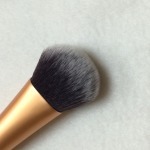 The Expert Face Brush is another brush that you must buy! I insist, get your hands on this one! It delivers the same results as the buffing brush. Then, why buying it? 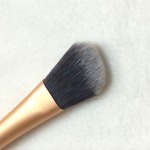 Because working on the area around your nose and eyes is easier being this brush a bit smaller, which also makes it great for applying blush and bronzer. 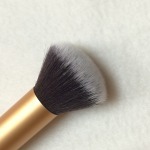 The Powder Brush is a big, dense and extremely soft brush. Great for applying loose and setting powders. 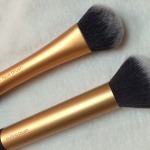 The brush picks up just the right amount of product and it evenly distributes it. 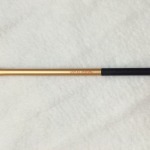 Some like to use it for contouring but I find the brush quite big for my face. Once again I hope you find this review helpful and stay stunned for the next review that will include some extra bushes besides the pink ones! Thanks for reading and stopping by! La espera del review de las brochas para cara de Real Techniques ha terminado! Si este es el primer review que estas leyendo acerca de esta línea de brochas, te invito a que leas el post con el review de las brochas para ojos. Ahí encontrarás una introducción rápida a la marca, calidad y creación de la línea de brochas y más información interesante. Empecemos con la Detailer Brush. Es la más pequeña del set Core Collection. Tal como su nombre lo dice, es estupenda para áreas pequeñas cuando deseas tener resultados detallados y precisos. Su forma es perfecta para iluminar la zona interna del ojo y para la aplicación de pigmentos en la parte central del ojo. También utilizo esta pequeña brocha para corregir áreas pequeñas además de trabajar perfectamente bien con productos para labios. 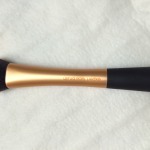 La Pointed Foundation Brush. La encuentro un poco pequeña para el tamaño de mi cara y me toma mucho tiempo aplicar la base con ella. Por otro lado, difumina perfectamente bien el corrector en la zona inferior del ojo. Siendo una brocha con terminación en punta te permite llegar hasta las zonas internas de ojos y nariz. 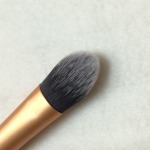 Por su forma en media luna la Contour Brush no sólo te da precisión en las áreas que estas trabajando sino que a la misma vez difumina el producto. Es por ello que con una sola brocha puedes contornear todo tu rostro. Esta brocha trabaja estupendamente bien con polvos, productos líquidos y en crema (iluminadores y bronceadores). Pruébala también para sellar tu corrector en la zona inferior del ojo. Aquí viene la brocha estrella de este set, la Buffing Brush! Si buscas un acabado impecable esta es la brocha que necesitas! Tiene el tamaño perfecto, hace el trabajo rapidísimo y se siente realmente suave en la piel. La he utilizado con bases de maquillaje tanto liquidas como en crema y los resultados son maravillosos. Además trabaja súper bien con rubores y bronceadores en crema. Amo amo amo esta brocha! 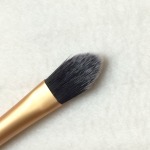 La Foundation Brush es una brocha plana y angular que es suave y firme a la vez. A pesar que se recomienda utilizarla para bases de maquillaje, yo prefiero usarla para aplicar primers, contornear y corregir la zona inferior de los ojos. Trabaja muy bien con productos tanto líquidos como en crema. La Essential Foundation Brush es más gruesa y un poco más ancha que la pointed foundation brush pero ambas tienen la misma forma. Entonces, utilizo esta en particular cuando tengo menos tiempo para aplicar mi maquillaje. Hace el trabajo mucho más rápido cubriendo áreas más grandes. 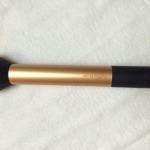 La Expert Face Brush es otra brocha que debes comprar! Insisto, tienes que comprarla! Esta te da los mismos resultados que la buffing brush. Entonces, por qué comprarla? Porque trabajar en el área alrededor de la nariz y ojos es más fácil ya que es un poco más pequeña, lo cual también la hace perfecta para aplicar rubor y bronceador. 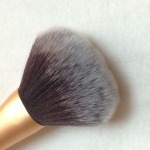 La Powder Brush es una brocha grande, densa y extremadamente suave. Estupenda para aplicar polvos sueltos y selladores. La brocha toma la cantidad correcta de productos y lo distribuye de manera uniforme sobre el rostro. A algunos les gusta usarla para contornear pero yo encuentro esta brocha un tanto grande para ello. Una vez más espero que este review te haya sido de ayuda. Mantente pendiente del próximo review el cual incluirá unas brochas extra aparte de las rosadas! Gracias por leernos y pasar por el blog! Buenísimo review, quiero que me saques de una duda ¿Es cierto que ya están a la venta en los Almacene Siman? Que bueno que te haya gustado el post, te cuento que si puedes encontrar las brochas en Almacenes Siman. Yo las he visto en La Gran Vía pero no estoy segura si las tienen en el resto de sucursales. Ojalá te animes a probarlas!